I spent all day yesterday and did this gallery painting. As matter of fact, I did this one on top of an old demo painting. I seldom work on my old paintings before because my mood has been changed from the early time. However, I think it is good exercise to paint the same painting twice. I can see what I did wrong earlier, and make the painting to the higher level. Thanks to my Facebook friends for the happy birthday notes to me. At this very moment, Song and Jonathan are baking the birthday cake for me. Nowadays, Facebook became so popular. I have a Facebook account, but I am not active at all with it. I think my blog is adequate for me. However, I am really curious if I have missed something important if I do not facebook. If you really Facebook savvy and benefit a lot from it, I would appreciate greatly if you can share with me, and show me some tips. Thanks. I painted with the PAA group yesterday at the downtown Austin. I felt good painting together with a few friends and weather was great too. However, my painting today taught me something. To be honest with you, this is not the type of painting I would like to paint. I always like to have something identifiable as a focal point. However, this one does not have one. 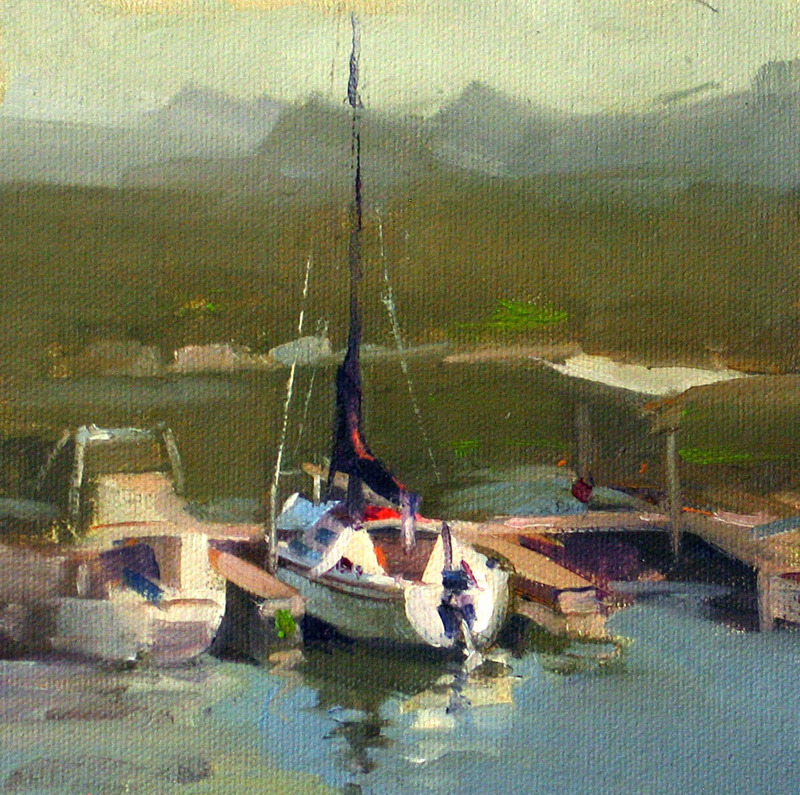 I think it is the issue (if I don’t call it a problem) of the plein air painting. 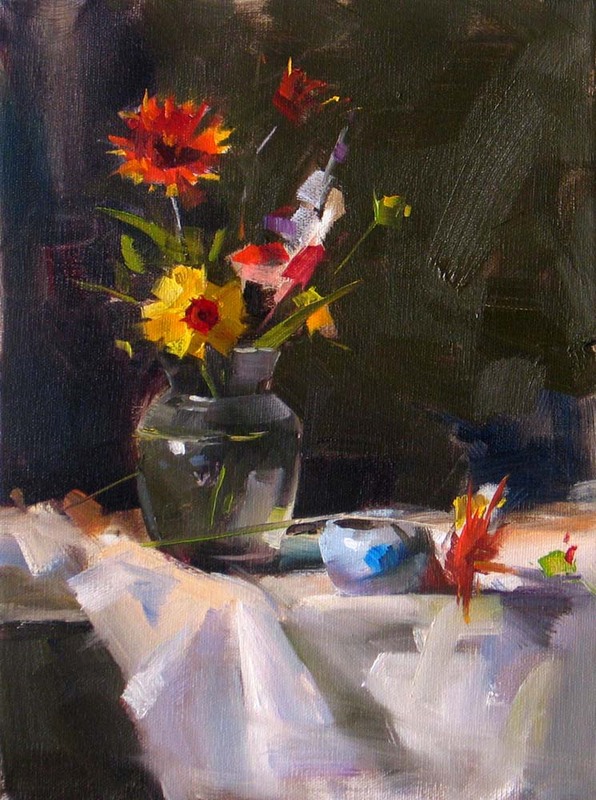 When the beauty of the scene in front of me cannot be represented by one or a small group of objects, I will have a hard time to make a painting work. Although it is not ideal, I still enjoyed the experience. 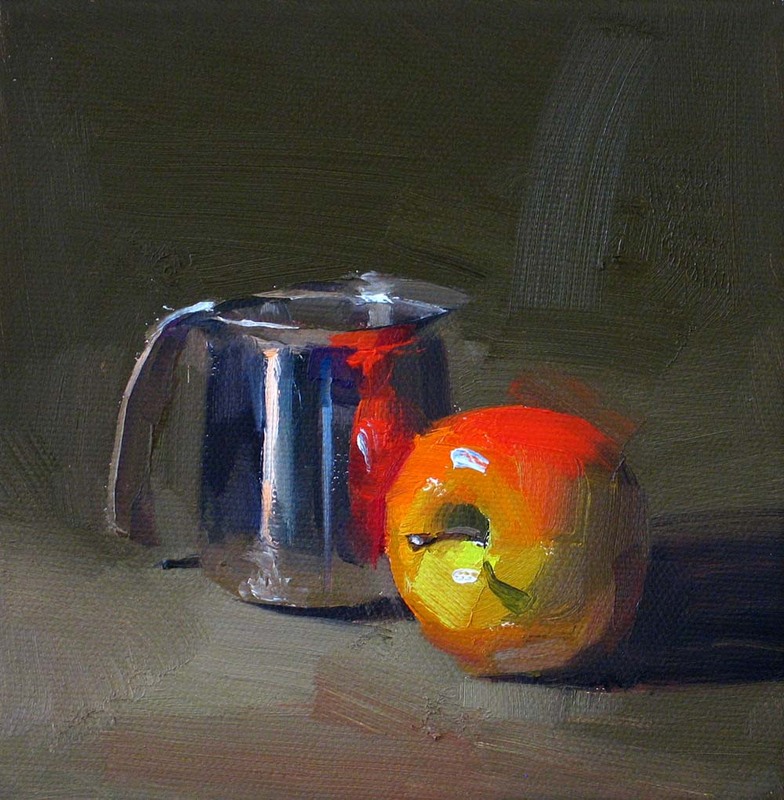 It is good exercise on the color study; I got better paint quality as well. I went to a marina this morning and did my second plein air boat painting. It was a great day, plenty of sunshine with no wind. My color got improved a little, but I still went through a quite struggle. Somehow, I can’t paint thick with my plain air so far. I think it is because I am not certain with what color I should use. I did a lot of blending and smearing, which I know I should not do. Well that is part of the learning curve. I continue working on my grays. I have a long way to go. “If you have WD-40, you can fix everything.” I don’t remember where I heard this saying, but it is definitely very handy for most of people who like to working on cars or anything mechanical. I am not a very handy person, but I do have the wishful thinking that there is something existing that can eliminate all problems in the world. We have too many problems, especially now. Well, let us keep our wishes in dreams, and confront our everyday challenges face to face. 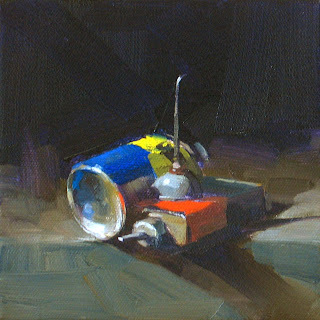 For my today’s painting, I included the WD-40 as a carrier of blue and yellow. 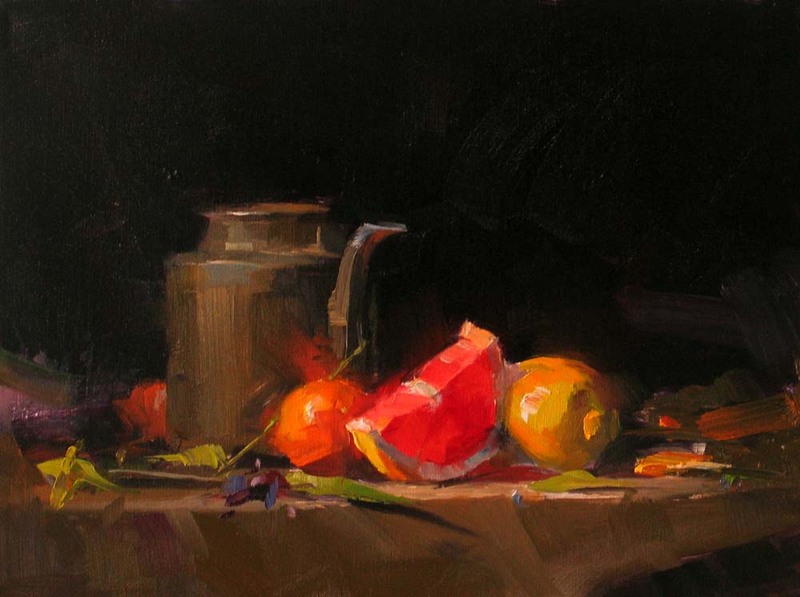 Different from my usual flower and fruit paintings, this one has more interesting shapes and designs. I spent much longer time setting it up, and really enjoyed painting it. Whether or not this type of painting has a market, I am curious. I put this WD-40 into the test, and see if it can fix a problem in art. Recently, you have seen so many my demo and plein air paintings. However, painting small still life, which is the center of my art, has been neglected for a while. 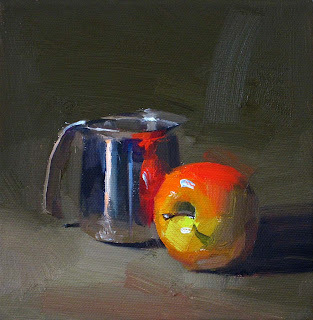 I finally freed some of my evenings, and resumed small paintings. I hope it is the sign that my life has started to be normalized. 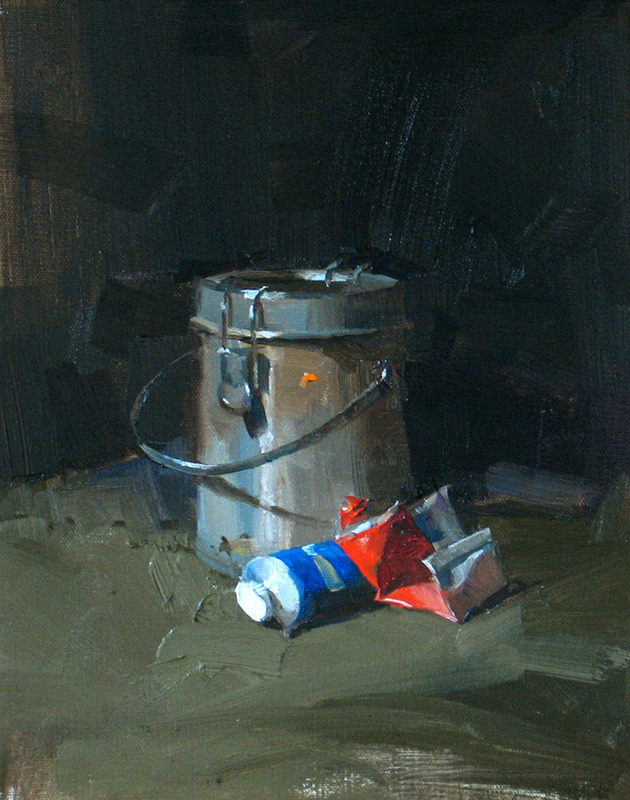 In this painting, I focused on doing the reflections on the steel cup. The distorted image of the apple makes an interesting shape. It is completely different from the apple itself. This makes me think. In our minds, the images of ourselves are usually formed from the reflections of the world. They are often distorted. We should always maintain a balance mind no matter how good or bad we think we are. I had another wonderful plein air day today. It was my first time painting boats from live, and it was also my first time using wide panorama format. I still feel clumsy of using grays. It will take me a while to develop the sensitivity. At least I feel I know what I am doing. This marina is only 5 minutes from my home. I will go there more often doing more boats. Last Friday evening, in pouring rain, I was on the road again. We travel to Conroe, TX attending the Lone Star Art Guild 2010 Convention. I did this demo in front of a large crowd. I had a relatively large canvas this time as well, but I have only two hours. I didn’t cover the canvas completely, but I kind of like the spontaneous look of the painting. 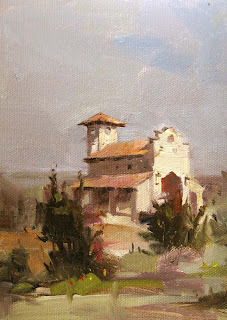 When I was in Scottsdale, AZ, my friend Li and Mark told me that there is beautiful place in south Austin called Chapel Dulcinea. 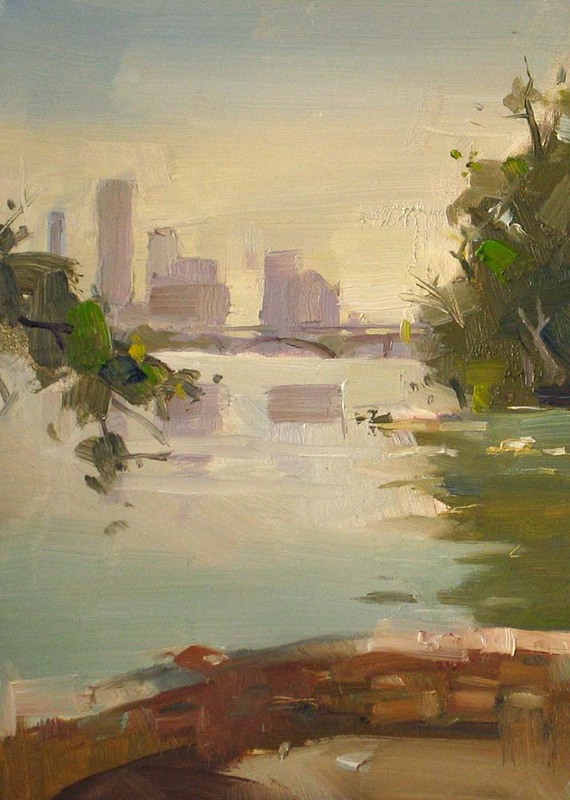 Coincidently, the local Plein Air Austin group had a paint out there this morning. 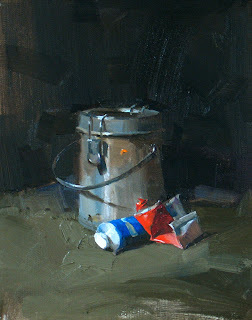 I went out with them and did this small oil sketch. The weather was great. I had a wonderful time. I started to have some feelings about plein air painting now. My value range is improving. My colors are more under control. The paint quality has not reach to the level I like yet, but it is getting closer. In a nutshell, I feel good about this one. 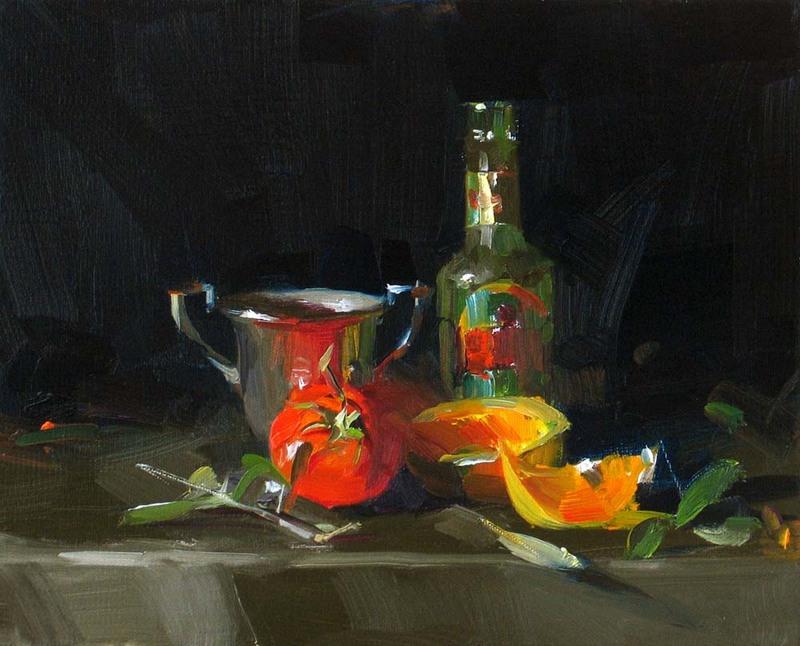 With one tomato, three quarters of an orange, and a bottle of beer, can we make a good drink out of those? Maybe, maybe not. My life is kind of like this. I am doing several things, which are completely unrelated to each other. I draw myself pretty thin now. My eBay store is very empty; I am behind on gallery paintings. I am flying all over the places. Some time I woke up in the morning, and couldn’t figure out where I was. On our company meetings, I felt really odd that I still blurted out gobbledygook that sounded technical. Many people told me that I have a wonderful problem. Well it is a problem for sure. I am learning really hard to manage my life. At this moment, I am still a lousy manager. It might take me while to go through the learn curve. My art will definitely suffer during this period, but please hang in there with me. In my technical career, I have learned the hard way. I have understood now that I must be an entrepreneur to survive in this money driven culture. Being talented can be a curse if you are not careful. Different from most of my workshops, I did not do a demo of painting roses this time. I was so overwhelmed by the beauty of wild flowers around me. I got a handful of Indian Blanket and Coreopsis. Without much of adjustment, this composition came out naturally. I had a great time painting this one. 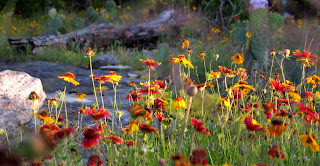 Submerged in all kinds of colors in the wild Texas hill country, I feel we are so blessed. We do not need to travel long to find beauty. The beautiful flowers are everywhere. They are free, and they are priceless. This is my first demo at the Wenmohs Ranch. I want to thank Dena Wenmohs for organizing this wonderful event. I met many new friends and saw a few old friends as well. 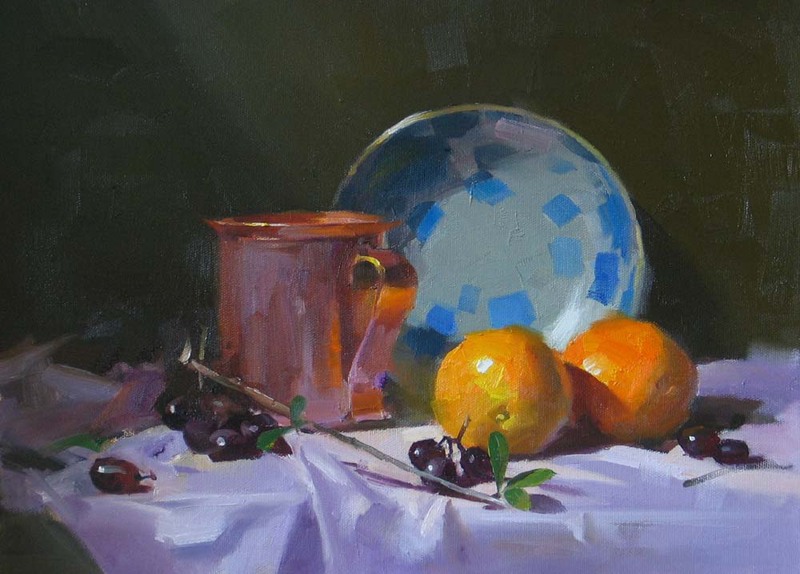 When I did this painting, I enjoyed so much of the vibrant red color when light transmitted through the grape fruit. 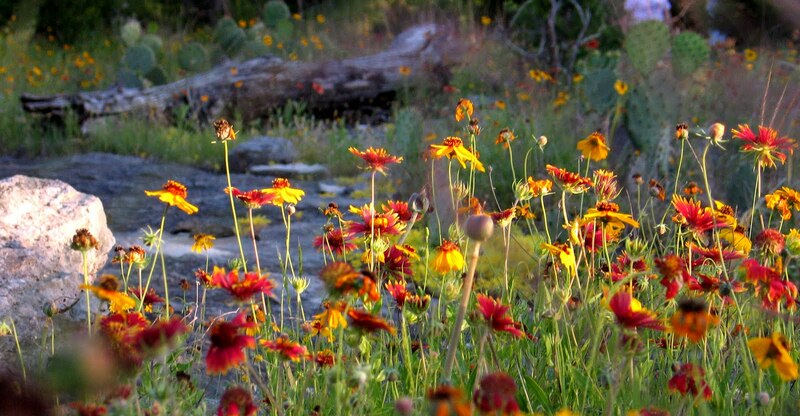 "Wild flowers at Wenmohs Ranch"
I am in the beautiful Texas hill country. The Wenmohs Ranch is very large and full of wild flowers. After the class today, we did a hike in the wild. Under the late afternoon sun, the scene is just incredibly beautiful. "With David Leffel at OPA"
I am sorry I don’t have a painting to show you today. I just came back from the OPA National Show at midnight yesterday. It was a great event. I was so excited meeting and seeing so many great artists. 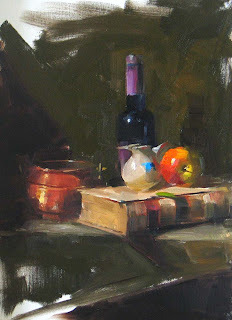 The photo above showing I was with the still life painting master David Leffel. 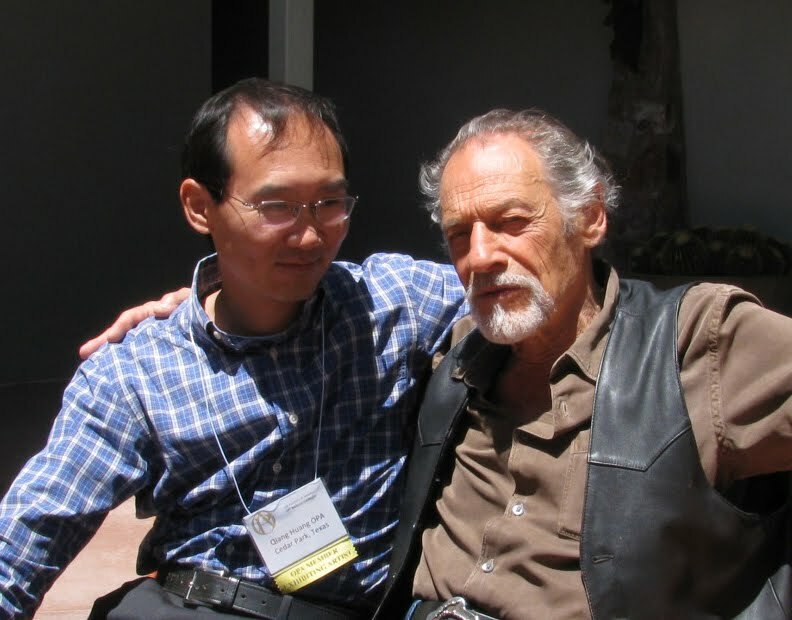 I am very grateful to have David as my teacher. I did not win anything this time, but I am very happy that my painting was sold right away at the reception night. I learned a lot this time from observing great paintings, watching masters demos, and discussion with other artists. It was a quite phenomenal and inspirational event. I went to work as a regular engineer today, but tomorrow I will be on my way to the Texas hill country. I will teach a painting workshop at Cypress Creek, TX starting on Wednesday.